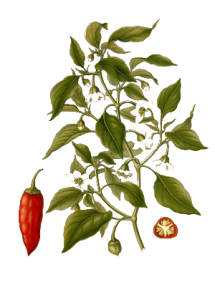 Cayenne pepper was named for the city of Cayenne in French Guiana but is also known by a variety of other names. It’s a great way to add an extra kick to your cooking although, for some people, it can make the meal a bit too hot. Spice of Life’s capsules are a great alternative way to benefit from the health benefits of this amazing spice. Your circulatory system will benefit from regular consumption of cayenne pepper. It reduces blood cholesterol and helps regulate the blood flow through your body – thus equalizing blood pressure. Cayenne also assists the body to dissolve fibrin, a substance critical to the development of blood clots. It seems strange for such a hot spice but cayenne pepper improves digestion. Digestive problems such as abdominal cramps, acidity and gas are reduced and it also acts as a diaretic. Along with vitamins A and C, B-complex vitamins and high levels of essential minerals, cayenne spice contains capsaicin. This is what makes cayenne so hot to eat. Capsaicin also assists with reducing inflammation and nerve pain. The vitamin A content of cayenne, in combination with its pro-vitamin A carotenoids, help to keep epithelial tissues healthy. This is particularly good as our ephithelial tissue cover or lines all our internal and external body surfaces.